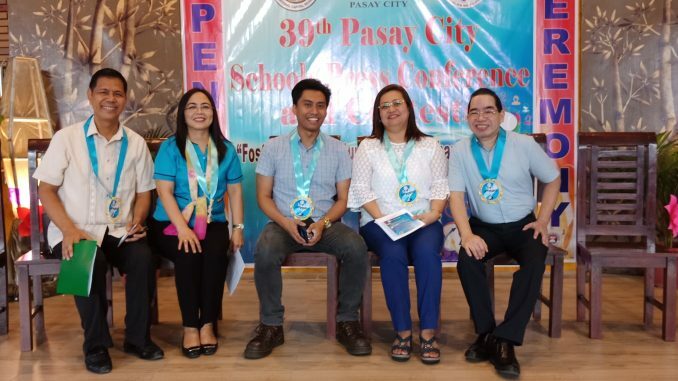 The Division of City Schools, Pasay City simultaneously conducted the 39th and 42th Division Press Conference and Contests (PCSPCC) on August 30, 31 and September 1, 2018 at Timoteo Paez Elementary School,Malibay Pasay City. The Opening Ceremony was attended by the Schools Division Superintendent Dr, Evangeline P. Ladines who signaled the Opening of the Conference and Contests. Dr.Melody P.Cruz, OIC Assistant Schools Division Superintendent, gave the inspirational message. She quoted Emily Zola’s statement, “The artist is nothing without work. This is why we look forward for a new day to have opportunity to work on our gifts and produce masterpieces”. She addressed the Campus Journalists to never get tired of combining their gifts with passion and positive attitude so that they can produce excellent results. On a similar context, the keynote Speaker Mr. Bam Alegre, GMA 7 journalist, encouraged them to strive harder and pursue their dreams. He stressed on his own humble beginning as once a campus journalist who eventually achieved his goal through hard work and perseverance. With the theme, “Fostering 21st Century Skills and Character –Based Education through Campus Journalism the contestants both in Elementary and Secondary Public and Private Schools have showcased their oral and written prowess both in English and Filipino in the Individual and Group Contests. Hailed as the overall champion in Elementary Level is Epifanio Delos Santos Elementary School.The runner ups are P.Zamora Elementary School 2nd place,Juan Sumulong & Kalayaan Elementary School 3rd place,St.Mary’s Academy 4th place and P Burgos Elementary School 5th place. Meanwhile, top 10 winners and contestants in the individual contests and the champion in the Group Contests shall represent the division in the 2018 Regional Schools Press Conference and Contests on September 26-October 5, 2018 at the Division of Marikina City as the host Division. In preparation for the Regional Schools Press Conference,the Division will conduct training-workshops on September 20-21,2018 at Epifanio Delos Santos Elementary School .The expenses to the trainings shall be sourced from the Division MOOE Fund.